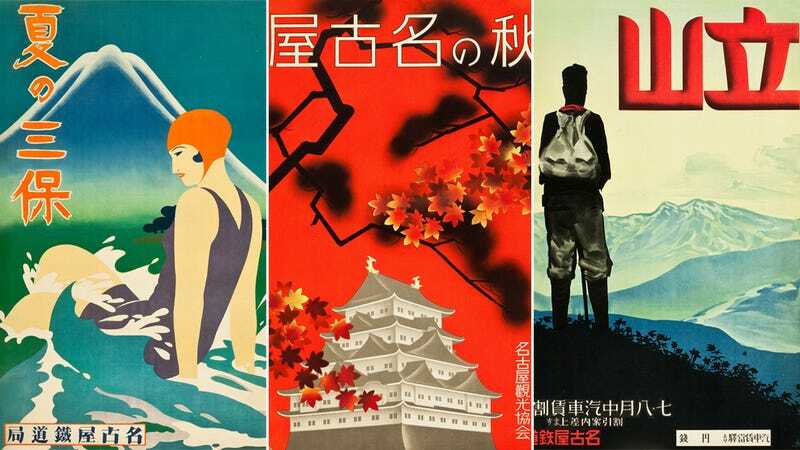 These extremely rare, previously unseen travel posters make me want to travel back in time and visit a Japan of another era. These beautiful graphics were recently rediscovered, and they'll auctioned off at the Vintage Movie Posters Signature Auction this month. The guy said his aunt had died and left him the contents of her antiques shop, which she had closed up years before. As he went through her stuff, he found a roll of old posters. The aunt dealt in furniture, so the posters may have been in the drawer of something she bought—I've seen that happen five or six times. Posters weren't her field, so she probably just put them aside. These beautiful posters were issued by Japanese rail agencies or tourism bureaus, and were created for domestic use only, to promote travel within Japan and its territories, to various national parks, hot spring resorts and other notable destinations. And damn, the graphic design. Following the sophisticated ukiyo-e way—the famous Japanese woodblock printmaking tradition–the graphics themselves are so perfect, I feel homesick for places I've never once been.